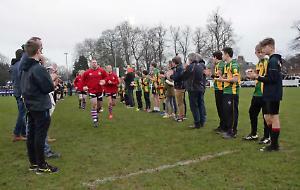 HENLEY under-12s emerged group winners before slipping to a narrow defeat against Beconsfield in their final game of the Reading Abbey Festival. For a team that thrives on pace and quick ball, the squad coped admirably with the muddy pitches and blustery conditions, focusing on retaining the ball and a more conservative style of play. The day started with a 4-0 victory against local rivals Reading. Henley debutant Tom Bonser combined well with Oscar Thomas to score an exciting try and Sam Winters scored what was to become their try of the day following an excellent run and off-load from Sam Bailey. Soon after, Ben Knight and Sam Bailey both scored, capitalising on some dominant tackling from Alfie Malcolm and assured scrum-half play from Jake Jackson. Next was a well-drilled and robust Rams team and Henley had to dig deep for their 3-1 win. Jonny Noctor scored a rampaging breakaway try, Dougie Amlot set up Ben Knight with wonderful fade and pass and Sam Winters scored a try with a fine individual effort. In their final pool game, Henley beat a strong and resilient Newbury team 2-0. Bailey and Winters both crossed the line again for Henley, but the platform for the win was based on some excellent defence, with Oli Johnson leading Charlie Baker, Laurence Walker and Oli Goforth in imperious form. As group winners, Henley went on to play old rivals Beaconsfield in the final game of the day. Henley put in a commendable performance, where Tom Smith, Hugo Donald and Will Corbett were outstanding, but the game slipped away from them in the second half with Beaconsfield making better use of the slope and the wind. Nonetheless a 3-1 defeat against one of the strongest sides in the region was a positive way to finish. The squad now has home fixtures against more local opposition before their season end tour to the Worcester Warriors Rugby Festival in April. They will move on to full matches as an under-13 age group next year.